I've started a new series, inspired by my watercolor wolf (see previous posts) and I've finally decided to name it. Wild in color. I feel like this fits. I'm rolling with it. 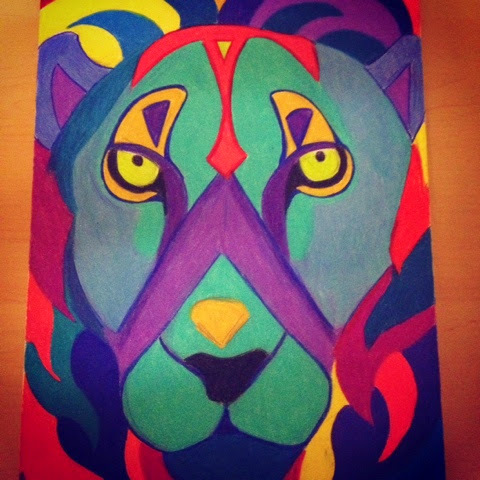 My newest addition is my portrait of a lion done with prismacolor pencils. I'm pretty fond of him. He's not perfect, but I'm still learning the ways of the colored pencil. Bear with me. I'm going to be experimenting with different mediums throughout my series, and perhaps I'll find a favorite. So far, I'm diggin the Watercolors. My next adventure will be a tiger on canvas, done with acrylics. He's already looking pretty awesome. I have a lot of these lined up, be prepared for more colorful awesome headed your way!